SnapTell Explorer and Amazon Mobile - iPhone J.D. 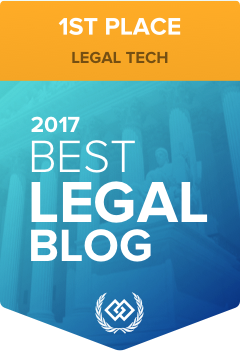 Lawyers read all day long as a part of our jobs, and yet many of us also love to read during our increasingly rare free time. Sometimes we see a book and think "hmm, I might want to read that one day." Of course, a few days later, you often forget about it. There are now two free iPhone apps that perform a neat trick. 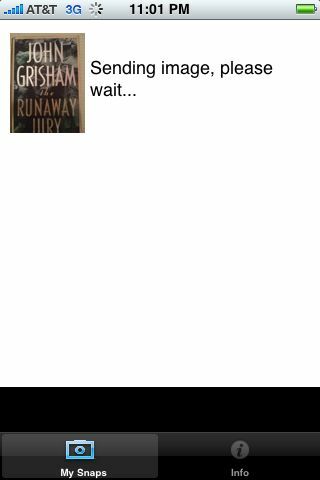 You can take a picture of a book using your iPhone, and then the app will figure out what the book is and give you information on the book, including links to buy it. The first such app is called SnapTell Explorer. It is very easy to use. 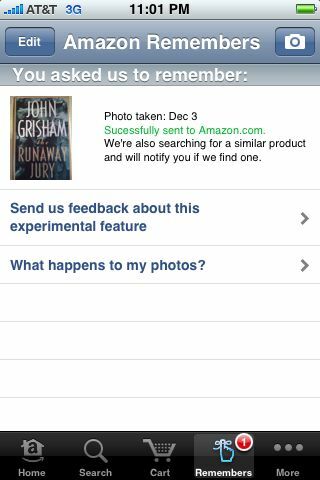 You start the app, take a picture of a book (or a CD, DVD or a video game), and then click one button to use your picture. 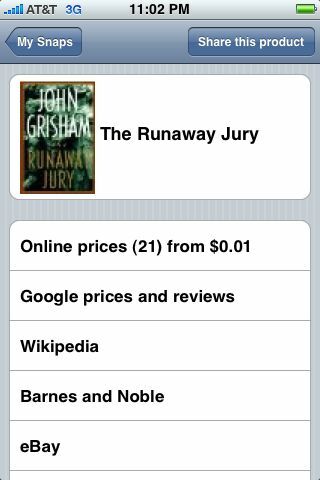 The app sends the picture off to a server, and within seconds it identifies the book and gives you links to buy the book various places on the web, look up info on the book on Wikipedia, etc. And even after you quit the app, it saves your prior entries. Thus, you can snap a picture of a book when you see it, and then a few days later start the app and you'll think "oh yeah, I wanted to remind myself to get that book" and you will have the resources at your fingertips to do so. Another app that does a similar trick is the free Amazon Mobile app. The primary function of the app is to be a great Amazon client on the iPhone. Search for items on Amazon, read reviews, purchase items, check the status of your previous orders, etc. 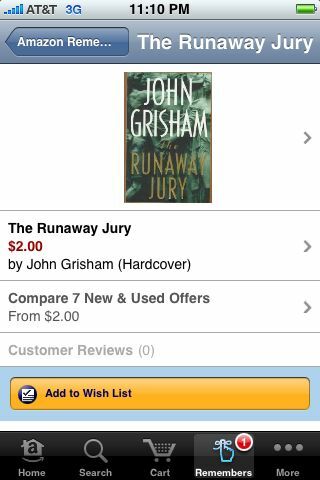 Although this app is new, those functions are not; Amazon has long had a great version of its website formatted for the iPhone. Just access the normal Amazon website on your iPhone at www.amazon.com and the Amazon website will sense that you are using Safari on an iPhone and automatically show you a full-featured version of the website that looks great on your screen. But the new feature added by the Amazon Mobile app is a feature called "Amazon Remembers." 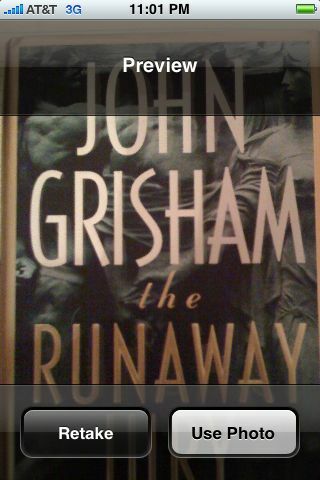 Just like SnapTell Explorer, you take a picture of a book (or any other item) with the iPhone. But instead of a computer analyzing the picture to determine what the book is, a real person will look at the picture, try to figure out what it is, and then send information to your Amazon Mobile app (and send you an e-mail) so that you can view the item on Amazon, read reviews, and if you want, buy it. (It appears that Amazon is using people who participate in its Mechanical Turk program do the work; Amazon reportedly pays them 10 cents for each one they do.) Amazon says it can take up to two days for an item to be analyzed, but in my tests it took only about a minute -- longer than SnapTell Explorer, but still very fast. On both SnapTell Explorer and Amazon Mobile, the feature doesn't always work. Indeed, Amazon explicitly warns that the Amazon Remembers feature is still experimental. But most of the time it works well, and frankly the fact that it works at all seems like magic, especially on SnapTell Explorer when you consider that a computer is successfully deciphering a book cover in just a few seconds. Apparently, you can tell a lot about a book from its cover. Click this button to download SnapTell Explorer for free from iTunes. Click this button to download Amazon Mobile for free from iTunes.